Be the first to share your favorite memory, photo or story of Carrie . This memorial page is dedicated for family, friends and future generations to celebrate the life of their loved one. 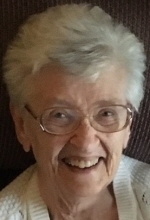 Carrie Juanita (Neatty) Baker, age 89 of Lexington, Ohio, and formerly of Spencer, Ohio, passed away peacefully in her home on February 14, 2017. She was born in Mt. Vernon, Ohio in 1927 to the late Virgil and Byrdie Parker. Neatty graduated from Mt. Vernon High School and Ashland College. She was an elementary school teacher for 35 years. She was preceded in death by her husband of 64 years, Rev. Robert A. Baker. They have four children; Ronald (Linda) Baker of Marietta, Georgia; Claudia (Mark) Bentley of Lexington, Ohio; Charlotte (Michael) Cole of Mansfield, Ohio; and Richard (Denise) Baker of Ontario, Ohio; 10 grandchildren and 9 great-grandchildren. Neatty was an only child, but is survived by two sisters-in-law, Greta Banbury and Janet Rehling of Mt. Vernon, Ohio. Neatty was a member of the Mansfield First United Methodist Church and Spencer United Methodist. As a Pastor's wife, she was involved in many church activities. She was a member of the Priscillian Club and Red Hat Society. She was a past Matron of The Ohio Eastern Star. Neatty enjoyed traveling and spending time with dear friends & family who was most important in her life. Funeral Service will be held Friday, Feb. 17, at 3:00 P.M. at the Spencer United Methodist Church in Spencer, Ohio. Rev. Lenore Robinson of Spencer will officiate. Friends may call Friday at the church from 1:00 – 3:00 P.M. Burial will follow the service at Spencer Cemetery. The family has asked that in lieu of flowers, gifts may be made to HomeCare Matters Hospice, 1220 North Market Street, Galion, Ohio in memory of Neatty Baker. Online condolences may be shared at www.parkerfuneralhomes.com . Arrangements by Parker Funeral Home, Spencer (330-648-2180). "Email Address" would like to share the life celebration of Carrie Juanita "Neatty" Baker. Click on the "link" to go to share a favorite memory or leave a condolence message for the family.